منصوری, رضا, قیطانچی, محمدرضا. (1394). مکان‌یابی زمین‌لرزه‌های ثبت شده در شبکه محلی به روش بازگشت زمان در منطقه ریگان. مجله ژئوفیزیک ایران, 9(2), -. رضا منصوری; محمدرضا قیطانچی. "مکان‌یابی زمین‌لرزه‌های ثبت شده در شبکه محلی به روش بازگشت زمان در منطقه ریگان". مجله ژئوفیزیک ایران, 9, 2, 1394, -. منصوری, رضا, قیطانچی, محمدرضا. (1394). 'مکان‌یابی زمین‌لرزه‌های ثبت شده در شبکه محلی به روش بازگشت زمان در منطقه ریگان', مجله ژئوفیزیک ایران, 9(2), pp. -. منصوری, رضا, قیطانچی, محمدرضا. مکان‌یابی زمین‌لرزه‌های ثبت شده در شبکه محلی به روش بازگشت زمان در منطقه ریگان. مجله ژئوفیزیک ایران, 1394; 9(2): -. روش بازگشت زمان به منظور بررسی مکان و پارامترهای چشمه زمین‌لرزه‌های گوناگون از سوی محققان مورد استفاده قرار گرفته است. در این روش برای محاسبه پارامترهای زمین‌لرزه، داده‌های ثبت شده به‌صورت معکوس در زمان زمین انتشار پیدا می‌کنند. در این تحقیق از روش خودکار برای تشخیص زمین‌لرزه‌ها و مکان‌یابی آنها به روش بازگشت زمان و شکل موج‌های پیوسته ثبت شده در فواصل محلی استفاده شده است. ابتدا داده‌های ثبت شده با عملگر آماری کشیدگی یا کورتوسیس (kurtosis) برای برجسته کردن زمان رسید امواج فشارشی مورد پردازش قرار می‌گیرد. سپس داده‌های پردازش شده در یک شبکه از نقاط تعریف شده درحکم چشمه‌های پتانسیلی مهاجرت داده و درنهایت برهم‌باریده می‌شوند. بیشینه محلی برهم‌بارش در زمان و مکان به‌ترتیب زمان وقوع زمین‌لرزه و مکان آن خواهد بود. 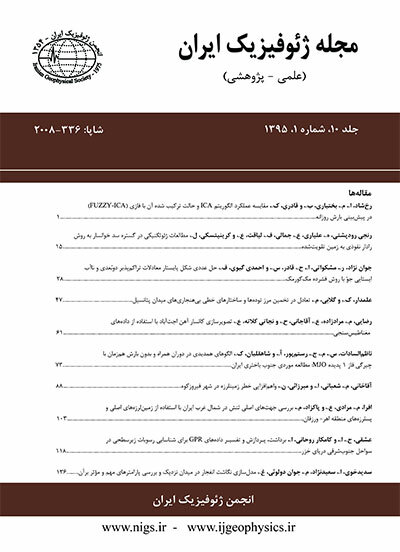 در این تحقیق روش بازگشت زمان برای محاسبه مکان پس‌لرزه‌های زمین‌لرزه 20 دسامبر 2010 که در شرق بلوک لوت در منطقه ریگان رخ داده‌، مورد استفاده قرار گرفته است. برای محاسبه مکان و تنظیم عملگر بازگشت زمان چندین شرط با استفاده از رویداد‌های مصنوعی مورد آزمایش قرار گرفته و در انتها پارامترهای به‌دست آمده از آزمایش مصنوعی برای پردازش و مکان‌یابی داده‌های واقعی ثبت شده در شبکه‌ای محلی در منطقه ریگان واقع در جنوب شرقی ایران مورد استفاده قرار گرفت. با وجود استفاده از پارامترهای به‌دست آمده از آزمایش مصنوعی، روشن شد که باید از چند محدودیت مانند تعداد ایستگاه‌های استفاده شده در مکان‌یابی برای بهینه‌کردن مکان زمین‌لرزه‌ها استفاده شود. نتایج به‌دست آمده از مکان‌یابی زمین‌لرزه‌ها، نشان‌دهنده یک زون لرزه‌خیز در منطقه است که احتمالا با یک گسل پنهان در ارتباط است. Rapid and accurate assessment of earthquake source parameters is extremely useful in seismology from different perspectives including hazard assessment and also for rapid response services. Nowadays, there exist various automated phase detection and location algorithms that provide near real-time seismic bulletins. Such algorithms rely on explicit phase identiï‌cation and complex event association techniques that must be reformulated for different velocity models accordingly. These algorithms often use only P and S phases (Withers et al., 1999). In many cases, the signal-to-noise ratio (SNR) is small, making it difï‌cult to use the classical methods based on phase identification. However, event location based on a migration approach has recently been proposed in seismology (e.g., Kawakatsu and Montagner, 2008; Larmat et al., 2009; Kim et al., 2011; Gharti et al., 2011) mostly because phase identiï‌cation is not required in this method. Time-reversal (hereafter referred to as TR) is a migration-based approach, in which the observed seismograms are back propagated in time in order to determine the location of the events. The TR method can potentially provide more accurate information on earthquake processes especially for small earthquakes where phase-identiï‌cation-based methods are hardly used due to a low SNR. In general, classic earthquake location is a nonlinear problem and linearization of travel time equations in earthquake location is mandatory based on a Taylor series expansion around some prior estimate (or guess). The locations of events also contain random errors, for example errors associated with the arrival time, as well as systematic biases due to manual phase picking. On the other hand, the most important error in earthquake locations with the TR method is only the inherent dependence of earthquake locations on an assumed seismic velocity structure of the Earth. The history of the TR method, which takes the advantage of none-phase identiï‌cation, can be traced back to automated local and regional seismic event detection and a location system using waveform correlation by McMechan (1985) and Whiters et al. (1999). In recent years, the same theory of waveform correlation is used by various researchers to investigate earthquake location in local (e.g. Maggi and Michelini, 2010), regional (OBrien et al., 2011) and telesimic distances (e.g. Ekstrom, 2006; Larmat et al., 2006) using the TR method. The time reversal algorithm has been recently used to study the location and characterization of seismic sources in elastic media. This algorithm is related to the back propagating of the recorded data in earth in reverse time to ï‌nd the parameters of an event. In this study, we investigate the location of small seismic events in south-eastern of Iran in an automatic mode. Most of the events are linked with structures of east of the Lut Block occurred after the main shock on 2010, December 20 with Mw 6.3. Data from a temporary network was used to investigate the P phase clariï‌cation using a kurtosis analysis on records and then it was migrated to the source in reversed time to ï‌nd the location of events without human bias. We tested several time reversal imaging conditions by synthesizing events for location. Finally, we used the best obtained parameters from a synthetic test to apply the same procedure to a real database observed after the main shock in the Rigan region which had been recorded by the network. We showed that although the obtained parameters were used in the real data, simple limitations such as number of contributed station in location should be used to improve the location. The results showed that well-constrained centers of events were in good agreement with the trend and dip of faults in the region and the focal mechanism of the main shock.